With the kiddos being home all summer long we’re on the hunt for fun stuff to do. I’d love to take them out every day, but Momma’s gotta do some work too. 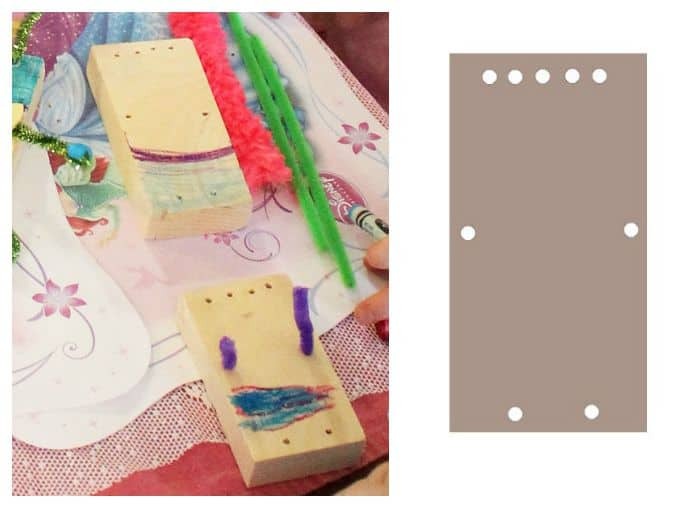 While I’m working the babes like to ‘help’, so I created this super duper easy wood scrap kids craft, that keeps their hands busy doing a wood project just like mom. 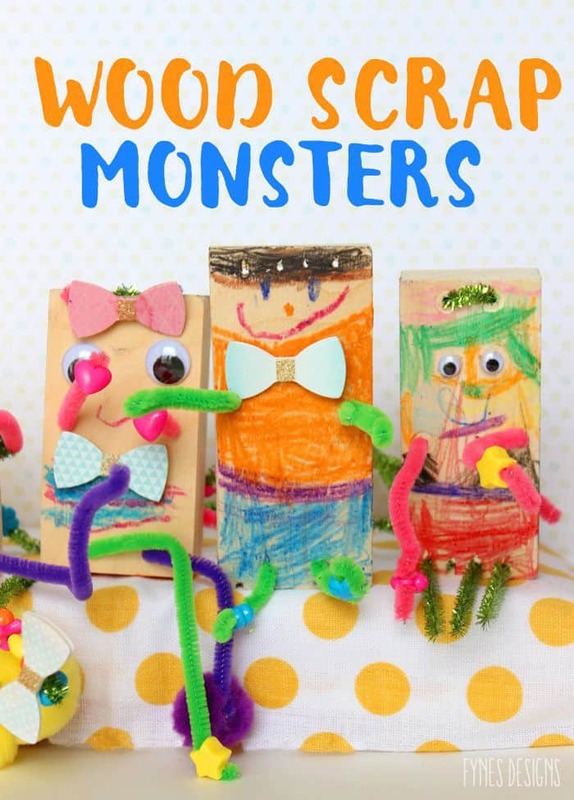 This wood scrap project is perfect indoors or out, and once the kids create their people or monsters they can play a game with them too, double whammy boredom buster! 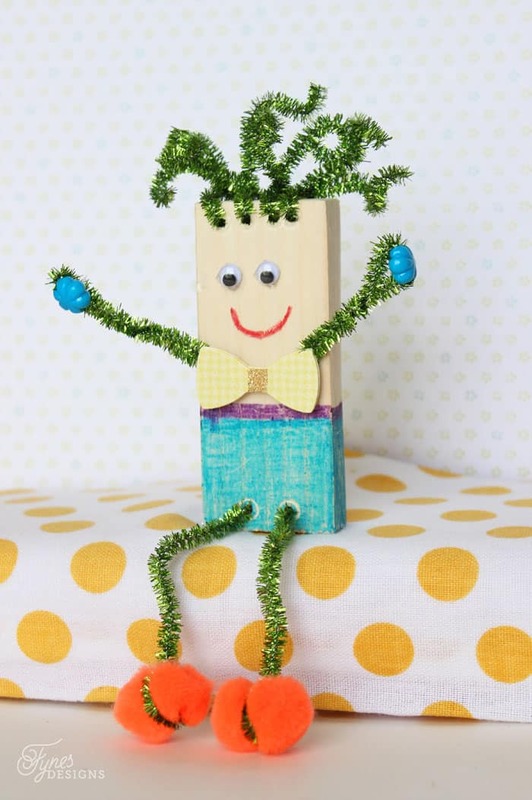 To get this project started, you’ll just need to drill small holes along the edge of the wood for hair, arms and legs. Then let their imagination take it from there! 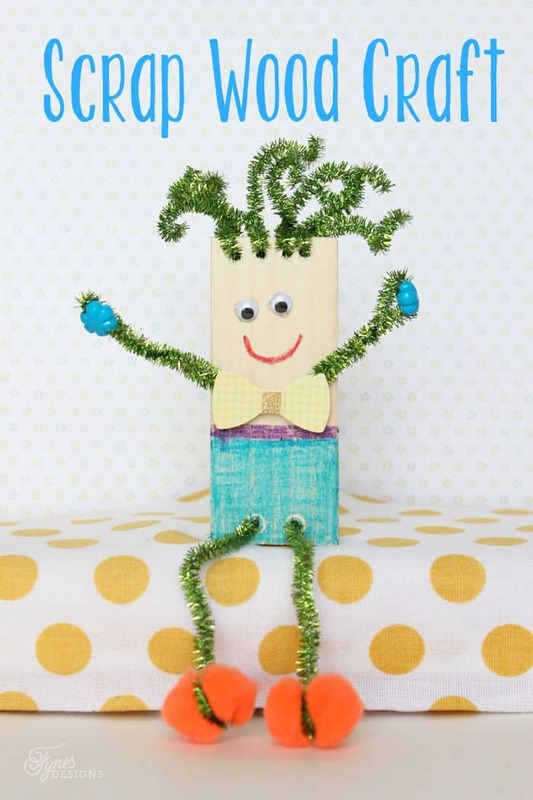 This wood scrap kids craft is perfect for all ages, and you can pick up all the decorations in a package at the dollar store. Foam stickers, glitter glue, yarn, and buttons, would be fun too. I love when crafts don’t involve scissors or glue, so they can just go at it. 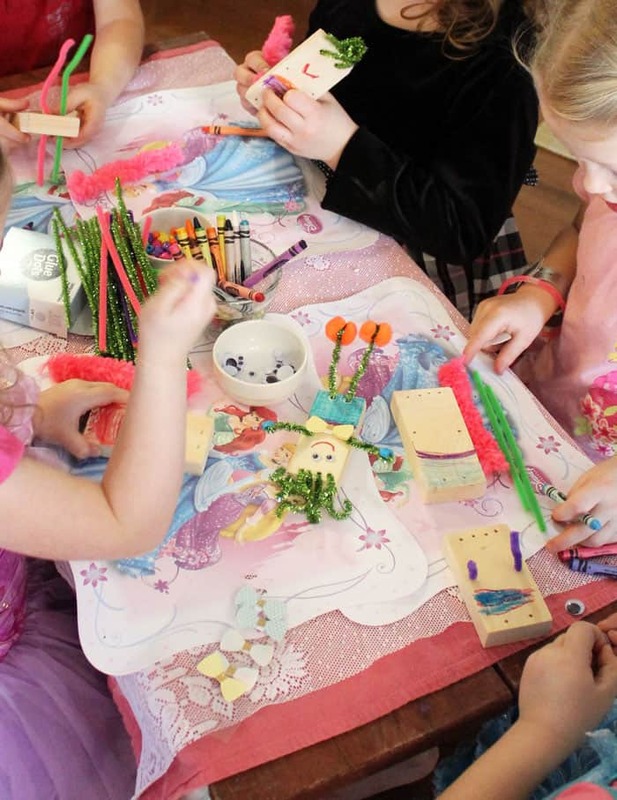 This little craft is perfect for parties too, when the kid to adult hand ratio is a bit off. Do these make you smile as much as they do me? I should have taken a photo of the back, because there are about 14 legs hiding behind there, and girl no. 2 has some seriously long locks! And those huge pom pom feet, ha ha ha!! Makes my guy look so preppy, he is really lacking character compared to those dudes! Hope everyone is having a super fun summer and keeping the kiddos busy! School time will roll back around before you know it! I love the idea of this craft. It looks like so much fun. I chose you for my featured posy at Snickerdoodle Sunday #9. Come take a look and pick up your cookie. Love it. And the toddler necklaces too! 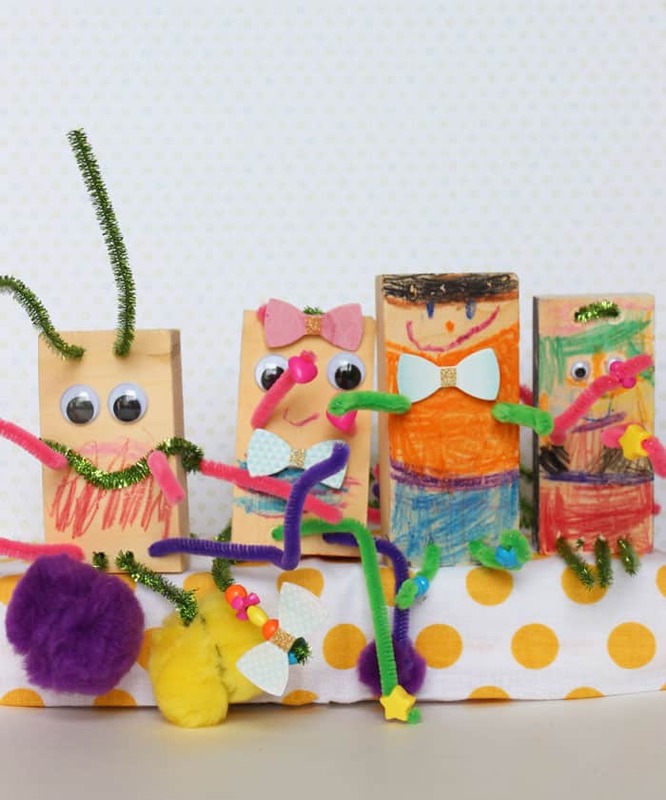 What a fun, cute project. Thanks for sharing with the Thursday Blog Hop!